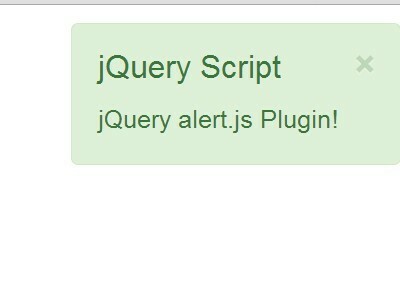 All the Free jQuery Plugins about 'Notification' are listed here. jBox is a flexible, modular, robust jQuery plugin to implement a wide variety of popup windows on your web page & application. NotifIt is a simple and fast jQuery plugin used to create various types of notification & alert windows with subtle sliding effects on the web page. Zebra_Dialog is a small (4KB minified), compact (one JS file, no dependencies other than jQuery 1.5.2+) and highly configurable dialog box plugin for jQuery. Simply Toast is a tiny jQuery plugin used to display stackable notification messages based on Boostrap 3 alert component. jQuery Growler is a lightweight and easy-to-setup jQuery plugin for creating Informative Messages which slide in and out from the upper right corner of the page. Toast is a jQuery notification plugin used to display animated, highly customizable & styleable, stackable visual feedback messages on your web page. overHang.js is a small jQuery plugin that helps you create flat style, sliding notification bars at the top of a given container. Notice is a tiny jQuery notification plugin used to add Android-like animated toast messages anywhere on your webpage/web application. m.toast is a really small jQuery plugin that displays a Android-style toast notification on your webpage that will destroy itself after a specified time. BS-Alerts is a jQuery plugin that make it easy to create jQuery event based notification bar (warning, error, success) using Twitter Bootstrap and HTML5 data- attribute. noty is a cool and powerful jQuery Notification Plugin that allows you to create several types of messages as an alternative to the standard alert dialog. notify is a super lightweight and customizable jQuery plugin that allows you to quickly create a notification box with some smooth fade in/out effects. Yet another jQuery notification plugin that makes use of Boostrap's alerts to create animated informative messages in your web/app page, similar to the Mac OS X's 'Growl' notification system. Lobibox is responsive jQuery dialog box & notification plugin that is divided into two parts: Messageboxes and Notifications. .
A super simple and lightweight jQuery plugin which pops up steam notifications with CSS3 based animations at bottom right corner of your web/app page. Toaster is a stylish and flexible jQuery notification plugin used to create growl-like toast messages using Bootstrap alert component. Notify bar is a simple-to-use yet highly configurable jQuery plugin used to display various types of message notifications on your webpage as you seen on Twitter. tinyNotice is a jQuery plugin used to create flat, eye-catching notification & confirm popups sliding out from the edge of your browser screen. Oh Snap is a simple and lightweight jQuery plugin for easily creating different types of notifications in your websites or mobile apps. notific8 is a jQuery plugin inspired by Windows 8 notification that helps create animated notifications which slide in and out from the upper right corner of the page. rustaMsgBox is a lightweight and easy jQuery plugin to display toast notification in a popup message box that slides out from the bottom of the page as you see in Android or iOS. biscuit.js is a jQuery plugin that displays cookie based, various types of notification messages with cool CSS3 animations on your webpage / web app. 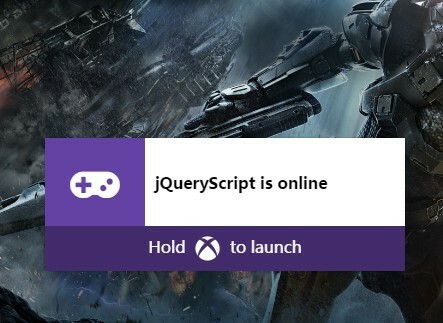 A jQuery based notification component which helps you create Xbox One style, animated, beautiful pull notifications on your webpage / web app. MsgPop is an easy jQuery plugin used to show growl like animated toast messages on your web page. Font awesome 4 is required for the icons next to your notifications. 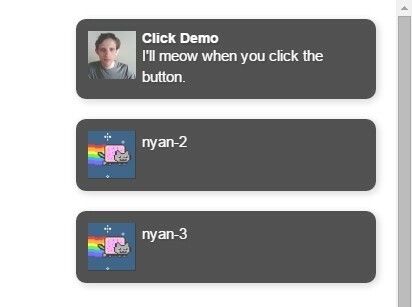 Meow is a lightweight jQuery plugin used to display growl-like toast messages on your web page. Supports both temporary and sticky toast notifications. tpPopup is a tiny and simple-to-use jQuery plugin used to display responsive notification popups with custom inline contents. Notify.js is a lightweight jQuery plugin that takes advantage of Bootstrap's alert component to display various types of growl notifications in your web project. firework.js is a small jQuery plugin which provides a simple way to display various notification messages on the top of your web project. dpToast is a very small jQuery plugin used to create nice clean toast notifications as you seen on the Android apps. Flash Messages is a jQuery plugin that displays popup messages and notification messages of various types on your webpage or inside a given container. Notiny is a tiny jQuery notification plugin helps you display Material Design snackbar style feedback messages with CSS3 powered show/hide animations on your webpage. Notifyr is a simple, customizable jQuery notification plugin used to pop-up growl-like notification messages on your website / web applications. al.js is a lightweight and easy-to-use jQuery modal dialog plugin to create notification popups that can alert a user of anything you choose. Dialogbox is a simple yet customizable jQuery plugin to create modal dialogs for alert, confirm, prompt actions and normal, success, warning, error messages. pop.js is a simple-to-use jQuery plugin used to display modal-style, draggable notification popups on your webpage / web application. toastr8 is a jQuery notification plugin for creating Windows 8 metro inspired toast messages that use Font Awesome for notification icons. 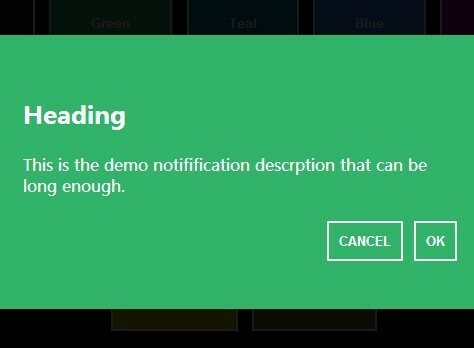 A super simple script that allows you to create a Windows 8-style responsive & flat notification interface using jQuery and CSS3. cosyAlert is a jQuery notification plugin that makes it easy to show various types of notifications (alert, error, success, notice) on your web page. Android Toast is a jQuery plugin to create Android-like toast pop-ups that display a certain amount of time and automatically fade out after a timeout. 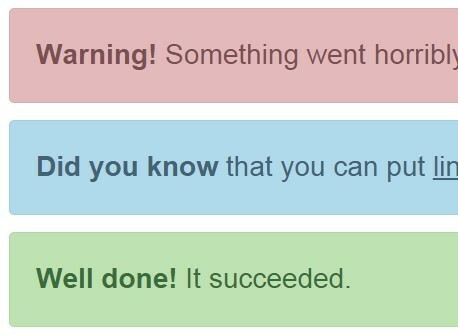 Yet another jQuery plugin to present growl-like, easy customizable toast messages that provides 'info', 'error', 'warning', 'alert', and 'success' styles. A jQuery plugin which makes use of jQuery UI and jQuery Mobile styles to show info or error message boxes on your webpage/web application. Tostie is a tiny (~1kb) jQuery plugin to display toast messages in responsive, slick and customizable notification bars. Lite Alert is a really simple jQuery notification plugin that displays fully CSS styleable alerts with custom messages on your web page / web application. A lightweight jQuery plugin used to create CSS3 powered animated notification bars which stick to the bottom of the web page. A tiny and cross browser jQuery plugin for creating Growl-style pop-up notifications that fade in and out from the upper right corner of the web page. Notifier is a lightweight yet heavily customizable jQuery plugin for creating animated attractive pop-up notifications on your web page/application. A tiny, cross-browser, growl-like jQuery notification plugin for showing unobtrusive, animated and customizable messages to your users. 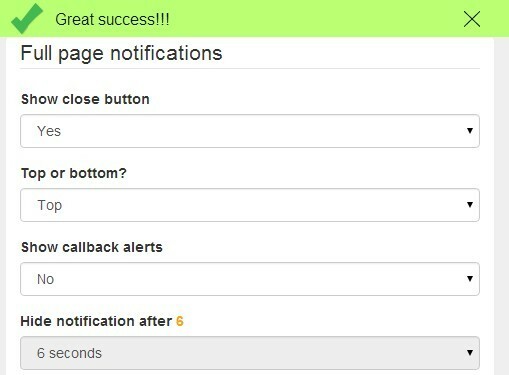 Extends the Bootstrap's alerts component to create animated & fully customizable notification messages on your web page. rtnotify is a simplest jQuery plugin used to display growl-style notifications that will always be stay in your screen or auto disappear after a timeout. Freenbar.js is a minimalist jQuery script which creates a fixed responsive notification bar sliding out from the top of your web page. getNotified is an easy-to-use jQuery plugin to create responsive notification bars that slides out from the top or bottom of your web page. A dead simple jQuery notification plugin which displays a group of stackable, auto-fading, and fix positioned message boxes in your web page/application. Notification Service is an extension for jQuery growl plugin that provides an easy way to display informative messages with appropriate icons. 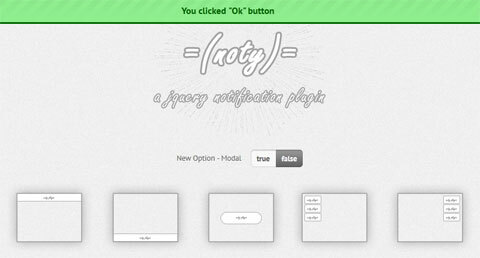 Yet another jQuery notification plugin used to display sticky, eye-catching message boxes on your website, with cool CSS3 animations based on Animate.css. alert.js is a jQuery notification plugin which allows you to display one or multiple alert messages via Bootstrap alerts components. Sudo Notify is a jQuery plugin that displays responsive, animated, nice-looking notification bars to announce important information to your visitors. Notify Me is a really simple jQuery plugin to create fixed notification bars/panels that can be positioned anywhere on your web/application page. Bootstrap Message is a jQuery plugin which allows you to create dynamic notification/feedback messages via Bootstrap Alerts component. Yet another toast plugin for jQuery and jQuery Mobile for broadcasting important notifications on the screen, as seen on the Android devices. A jQuery and jQuery UI based notification plugin used to display a full width message bar sliding out from the top of your screen. iGrowl is a lightweight yet robust jQuery plugin to display Growl-like responsive notification boxes with cool CSS3 animations based on animate.css. notiJ is a small jQuery plugin to create animated and customizable notification boxes that can be placed anywhere on your web page. notify is a simple jQuery plugin for creating customizable auto-fading notification messages that can appear anywhere and anytime on your web page. MX Notice is a simple clean jQuery responsive notification plugin to display important messages (error, info, success) in the center of the screen or at the top of the web page. ialert is a simplist jQuery plugin used to create an auto-hiding popup window on your web page. obNotificationCenter.js is a lightweight and easy jQuery plugin for creating a iOS 7 style notification center that will slide from the top of your page when triggered. notifyme is a lightweight jQuery plugin used to display alert, warning and error messages in the grouped notification boxes. 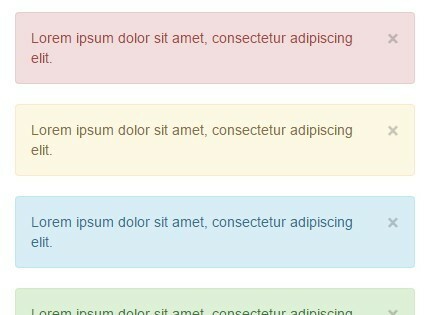 A dead simple jQuery plugin to create alert & notification information boxes with cool CSS3 animations. 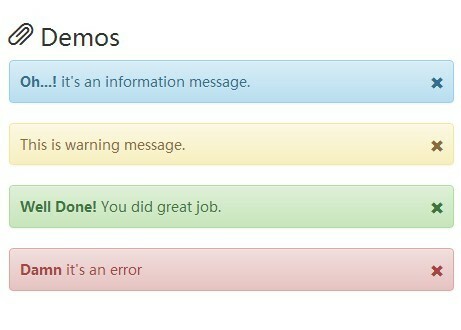 emergejs is an ultra-light and easy jQuery plugin for creating simple animated notification popups on your website. Tikslus Notirious is a jQuery plugin for creating various types of notifications to display website messages, with support for progress bar, CSS3 animations and much more. 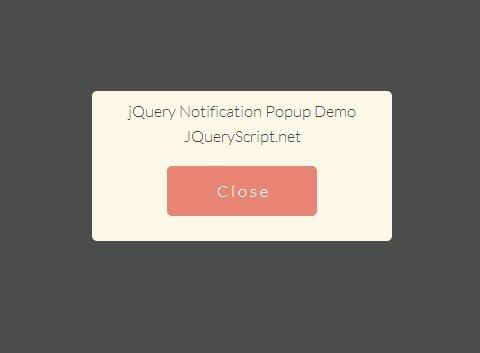 Yet another jQuery notification plugin to display website messages in animated and highly customizable flyout notification boxes. Notification Popup is a jQuery plugin allows you to create a full page, fully responsive and flat style notification box with subtle CSS3 transition effects. 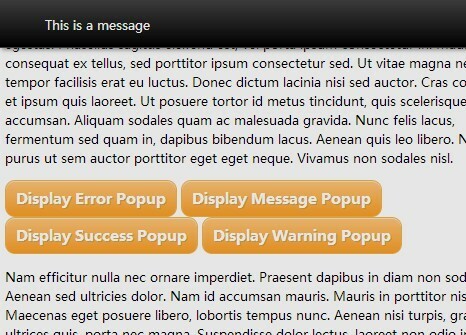 Bootstrap Msg is a jQuery plugin that uses Bootstrap's alerts component to display alert messages in a sliding message bar at the top of the page. stickynotif is a lightweight jQuery plugin that make is easier to display grouped messages in a sticky notification box. goNotification is a jQuery notification plugin inspired by Ghost blogging platform that supports multiple notification types such as info, error, warning, success, and loading. Sticky is a lightweight & simple to use jQuery notification plugin for displaying info/alert/error/warning messages in grouped, streamlined and fix-positioned notification boxes that can be placed anywhere on the web page. jNotify is a simple and easy to use jQuery notification plugin for creating messages bubbles that can be placed at any corner of your web page. cftoaster is a simple jQuery plugin for creating Android-style toaster messages centered in the page to display the important notifications to your users. Bootbar is a lightweight and easy to use jQuery plugin styled with Bootstrap 3 that creates various types of stacked notification bars with simple slide away animations. ClassyNotty is a jQuery Plugin that allows you to add beautiful and iOS-like elegant notifications for your applications. Notifications.js is a notification library built with jQuery for creating flat styled notification bars sliding out from the right bottom of your page. AlertView is a simple, quick and lightweight jQuery plugin for creating OS X like notification windows and Twitter-like alert messages on your web page. jQuery w8n is a super lightweight plugin for creating Windows 8 style notifications that will slide in and out from the upper right corner of the page. Messenger is a jQuery notification plugin that allows to trigger transactional messages with actions (undo, cancel, etc.) in your web app. liga.js is an Useful and Multi FunctionaljQuery Plugin that brings together a number of common features in web applications such as windows, messages, notification, form validation, AJAX history and more. Notify Better is a jQuery plugin that allows you to show important information alerts via favicon, browser title and more. Ideal for pending notifications, unread messages, etc. 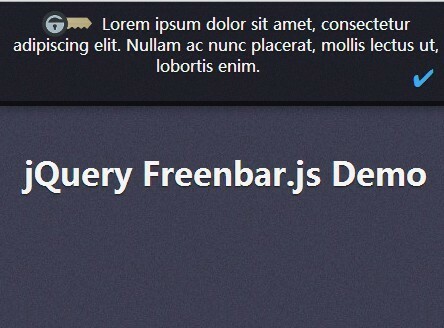 TopBar is a small jQuery plugin for creating various notification bars (success, info, warning, danger, primary, default, ...) at the top of your web page. ios.notify.js is a responsive and mobile-friendly jQuery plugin for creating Apple iOS style drop down notifications with CSS3 3D transforms on your web page. iosOverlay.js is a responsive and mobile-friendly jQuery plugin for creating Apple iOS style loading spinner, overlay and notification for your website. jBar is a simple and lightweight jQuery Plugin for add a Notification Bar to your website for displaying important informations. WNF is a jQuery based web notification fallback plugin that allows your web site or web app to degrade gracefully while you're using the newest HTML5 Web Notification API. toast is a super simple and easy-to-use jQuery plugin that allows you to create a notification bar with smooth fade in / out effects for displaying important messages of your website. 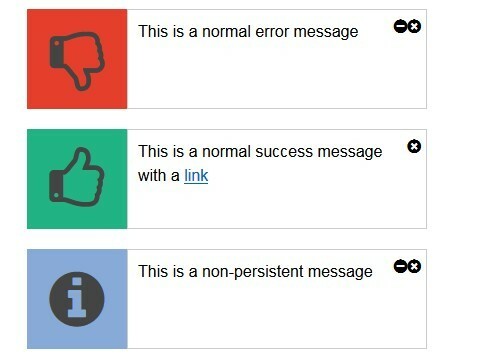 Alertify is a Customizable jQuery Notification Plugin. Notification system is a very useful tool for webmaster to tell visiters the lastest and most importtant informations. jQuery Password is a jQuery based plugin that checks/scores the password strength your user input, and then shows the strength problem of the password. Howdy-do is a jQuery plugin that helps you create a Stackoverflow-Like Notification Bar on the top of your page. msgTips is an useful jQuery Plugin that add a Notification Bar on the top of your website with smooth fade in and fade out effects. A simple and easy-to-use jQuery plugin that shows the strength of you passwords by telling you how long time it would take to brute force them.